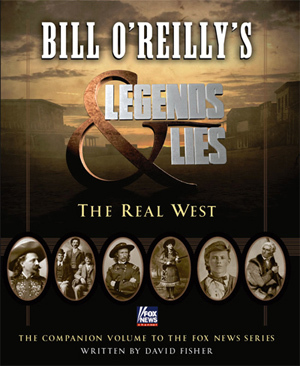 I recently finished reading another great book from Bill O’Reilly: Legends & Lies – The Real West. Like Killing Jesus, this gem from O’Reilly gets down to the facts behind the lives of legends – except as we find out when reading this book, the men involved aren’t always cracked up to the history books’ portrayals. Legends & Lies really made me reflect on Churchill’s famous quote “History will be kind to me for I intend to write it.” The author of ‘history’ determines who the heroes and villains are in our minds. And to a degree, Legends & Lies makes you rethink Old Western history. Legends & Lies was written by David Fisher with the support of Bill O’Reilly. The book accurately explains the lives of America’s most prominent frontiersmen – no Hollywood hype, just facts. It is a real page-turner, consisting of rather short stories (about 30 pages each), perfect for those of us who are limited on time, but love to read. Who Were These Legends of The West? The book covers the lives of a dozen frontier legends, explaining all of their shortcomings, mistakes and triumphs. It explains what the history books largely ignored. It tells us the truth about these legends. What initially drew me to the book was the fact that it was promoted as an accurate account of the lives of some of my favorite western legends, specifically Doc Holliday, Jesse James and Billy the Kid. The lasting impression on me from this book, however, was learning about the lives of Daniel Boone –America’s first true frontiersman — Kit Carson, perhaps the greatest American Indian fighter but yet a man who deeply respected the natives’ culture, and Bass Reeves, the real life Lone Ranger. Reeves was a black law-man who, given the times, faced challenges you would expect. He was a man with an unwavering moral compass, going so far as to arrest his own son for shooting his wife. After reading Legends & Lies you really begin to understand just how rugged, unpredictable and unstable the West was for over 100 years. For modern standards, it was extremely lawless, almost barbaric. Filled with criminals, self-serving law-men, prostitutes, mines, casinos and native Indians, the West took a long time to establish stability. And as it was being settled, entertainers and the media would fabricate the events that took place in the West to sell editorials, dime novels and plays to Northerners who were mystified by the untamed region, yet too scared to go there on their own and see what it was really like. 1. They were very entrepreneurial and looking for new opportunity and prosperity; often seeking commodities such as gold, land or other new business ideas to start in western boom towns. There are even specific instances of bandits reinvesting their ill-gotten gains into small businesses. 2. They were politically motivated. During the mid-to-late 1800s, much controversy surrounded decisions being made in Washington (namely how to deal with the native Indians, and slavery). Several men in the book acted out (usually by robbing banks, stage coaches and trains) against political decisions being made in Washington, or used their ‘tough guy’ reputations in the West to springboard their own political careers. 3. They were lost. Lacking much opportunity to make a living in the West, many of the characters took up arms because it provided an occupation (both law-men and criminals). Some of the bandits who lived on the run were simply short on ideas how to make a buck, and chose a life of crime as a means to an end. It’s clear that many of these men later regretted their ‘career choice’ but had few options to get out of crime once established. Same went for the law-men. As the West grew, often without much infrastructure to support its population growth, law-men were expeditiously given a badge without much training or moral guidelines. Many law-men in the West served similar purposes as bouncers do today. They were there to exude a presence in hopes it would keep the cowboys somewhat tamed. However, they were typically no match for the cowboys if things turned violent. That’s what made the likes of Doc Holliday, Wyatt Earp, Bass Reeves and Wild Bill Hickok particularly special. They were fearless law-men with a relatively strong moral compass, and could give the cowboys a fight, if needed. David Fisher and Bill O’Reilly’s Legends & Lies is a fantastic read for Western enthusiasts and entrepreneurs. The characters were daring, innovative and often took risks that others at the time thought were crazy. But in many cases, their actions changed the way society functioned, both for the better and worse. With a pregnant wife, a hyper 2-year old and busy work life, the timing of this read was perfect for me. The 12 stories were about 30 pages long each, making it an easy and entertaining read for those of you in a similar busy stage in your life. I highly recommend you pick up a copy of Legends & Lies – The Real West. Click here to get a copy today.